It’s blog tour day for Jessicamap Reviews! If you’ve seen some of my reviews and posts before, then you know I’m a HUGE fan of any kind of political or espionage thriller. Spoiler – this one was incredible. In High Hand the billionaire Republic nominee, Stuart Roberts, is on a glide path to the White House until a bomb explodes during a campaign rally in Los Angeles leaving him seriously injured. Is there a connection between a bomb blast meant to kill the presumptive Republican presidential nominee and a group of prominent men who played poker in Moscow years ago? Fifteen years earlier, while serving as a US ambassador to Russia, Roberts was one of the poker players in a group organized by Frank Adams, a Moscow correspondent and top investigative reporter for the Los Angeles Register. The story centers around Frank Adams, who is on a mission to figure out why his old poker buddies are being targeted for assassination. When Adams gets a call from an old friend in Russia, he returns to his old stomping ground and risks his life in a high-stakes bid to uncover the truth about the Republican presidential candidate’s secret ties to Russia. In the midst of threats to reporters, Adams discovers bizarre intervention by President Vladimir Putin and a US spy agency’s covert effort to alter the presidential race. When I see a new political or espionage thriller coming out, I already know I have to pick it up! 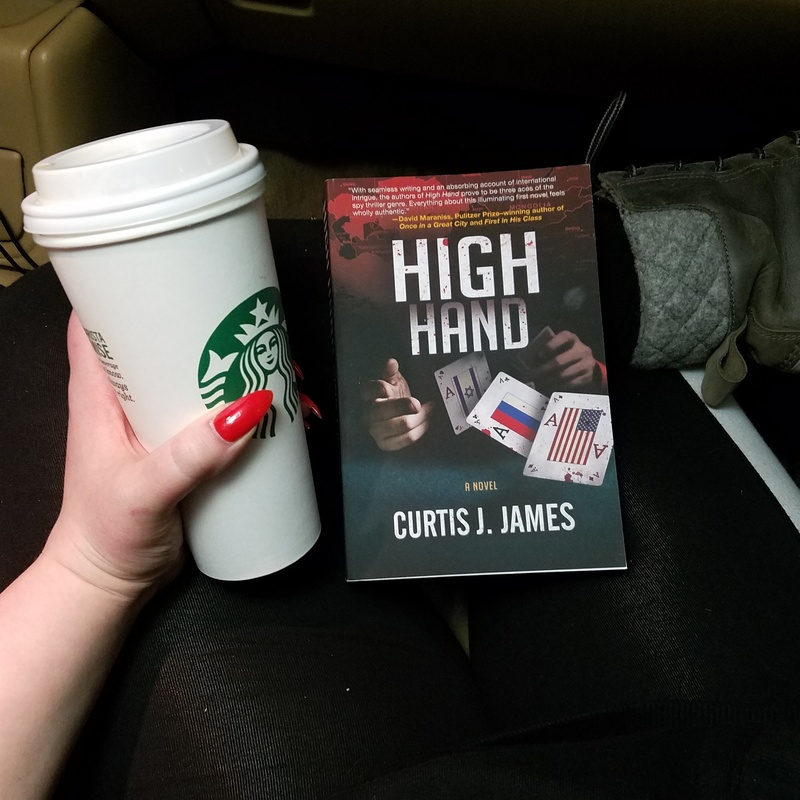 HIGH HAND by the writing trio known as Curtis J. James is one of those thrillers that is a fantastic reason why I love this genre. Sometimes its eerie with how relevant some of these books can be. During a campaign rally, Republican nominee, Stuart Roberts, a bomb goes off that leaves him severely injured. It is suspected that the bombing is connected back to Roberts’ time in Moscow almost two decades earlier – but why would they want to take out the presumptive Republican presidential nominee? Fifteen years earlier, Roberts was an ambassador to Russia and was part of a poker group that was led by Frank Adams. Adams was one of the top investigative reporters for the LA Register and was a Moscow correspondent. When all of his poker buddies are being targeted, Frank is on a mission to find out why this is happening and who is behind this. When he has to return to Moscow he finds his life on the line to uncover the truth about the secret ties between the Republican Candidate and the Russian government. This is incredibly and eerily relevant to today’s world and events. I think that’s something I admire about this genre. If anything, it can help some people want to pay attention more. I’m always hesitant when approaching a book that is co-authored. Not because I don’t think it’ll be good, but because I’m always curious how the writing styles will mesh together. Well, the trio of authors that make up Curtis J. James did a fantastic job! The fluidity of the book was perfect and the pacing kept me flying through the pages. Their knowledge and research shines through in this book, without it getting too wordy or feeling like a textbook or research paper. Overall, if you want a great political thriller, then you need to grab HIGH HAND. I know this won’t be for everyone because politically themed books are hit or miss for some readers, but this is one I’d recommend taking a chance on. You’ll find yourself drawn in! research. Dr. Harris has published more than 500 journal articles and 100 book chapters, has edited 10 books, and holds more than 25 advanced biotechnology patents owned by the US government. He is chief of the Laboratory of Human Carcinogenesis at the NIH National Cancer Institute. He is adjunct Professor of Oncology at Georgetown University School of Medicine. reported from Moscow during the historic collapse of the Soviet Union. Since then, he has covered the Pentagon, the White House and Congress, producing a number of complex investigative articles on insecure nuclear weapons (“loose nukes”) in Russia; alleged Saudi complicity in the Sept. 11 attacks; sleeper Islamic jihadist cells in Europe; and a range of other cutting-edge topics.